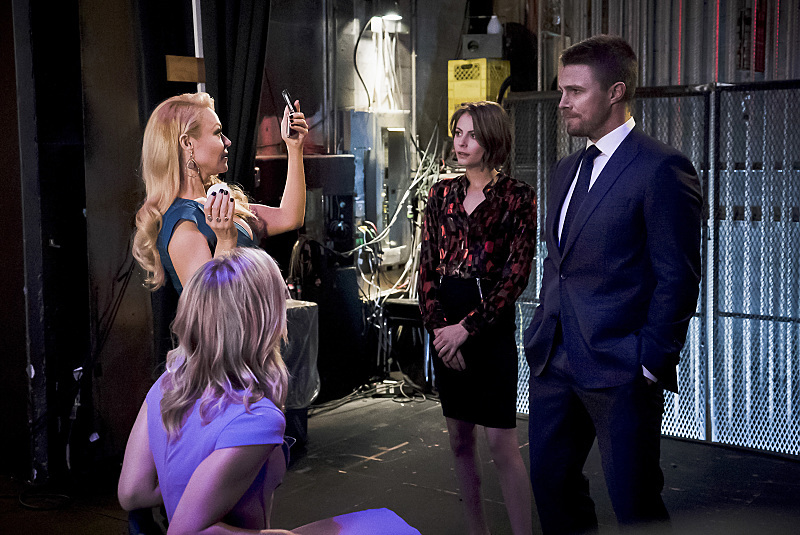 Arrow -- "Code of Silence" -- Image AR414b_0007b.jpg -- Pictured (L-R): Charlotte Ross as Donna Smoak, Emily Bett Rickards as Felicity Smoak, Willa Holland as Thea Queen, and Stephen Amell as Oliver Queen -- Photo: Katie Yu/ The CW -- ÃÂ© 2016 The CW Network, LLC. All Rights Reserved. Oliver prepares for the mayoral debate with his team when his opponent Ruve Davis, wife of Damien Darhk, arrives. He inclines if that is her maiden name and she reveals she’s not married. Well, how about that. Thea reveals their team is working on finding some dirt on her, but they’ve got nothing so far. To further this, the team suits up and follows her as she leaves the hall. Oliver tracks her down to an underpass where she reappears with some Ghosts. Team Arrow takes them down, but Davis escapes. Later they can’t figure out Darhk’s play for wanting to destroy the city and now have his wife run for mayor. In HIVE HQ, they have a meeting about their plans where Darhk tells his wife about the info that Merlyn revealed to him. One of the other members of HIVE isn’t convinced Darhk’s wife can pull this off, so he kills him through the TV. Another loose end comes up, Quentin Lance, which Darhk says they’re handling. Laurel goes to see her father, she’s worried about him being a target but he can’t be bothered. Lance is called out to a crime scene and Laurel decides to tag along, even though Quentin is trying to get on a hot date with Mama Smoak afterward. Oliver and Felicity return to the loft where the previously-mentioned matriarch is setting up decorations for their engagement party. Thea swings by with some dirt for Oliver, but it’s not on Ruve Davis, it’s on him. The lawyers uncovered an uncashed check their mother wrote a Samantha Clayton, the woman pregnant with Oliver’s child she paid to have it taken care of. Oliver plays dumb to the whole thing and makes up some silly excuses for what it could be. On the island, the prisoners are busy digging, and one of them tries to get under Oliver’s skin for being “Reiter’s pet.” He reveals they’ll kill him too and the guards won’t care. They prove this to be true by leaving. Laurel and her feather arrive at the scene, a simple breaking and entering, and Quentin goes inside to find nothing of substance, until a piece of wood flies down and smacks him in the noggin. His daughter is Black Canary after all, so she leaps in and they outrun the collapsing building. In the Arrow Cave, they patch him up and talk about how it was made to look like an accident. Though Lance has plans, the team forces him to stay there for his protection. They all split up for their own assignments as per usual. Diggle: Talk to Andy; Felicity: backtrace the phone call; and Oliver: prepare for the debate. Back on the island, Taiana defends Oliver from the others and he tries to convince them he isn’t their enemy. To do this, though, they say he needs to kill Conklin. Mama Smoak arrives at the campaign offices to see Captain Lance, who makes a bad cover story about gambling debts and says maybe they should take a break. She agrees but wants the time table extended from “a few weeks,” to forever. She leaves in a fit, sending alarm bells off for Felicity, but she’s got something. The call for the incident didn’t come from the SCPD dispatch, but a HIVE phone. She traces the call and the team goes to the spot where they find the demolition team, all armed with their own tools (literally, tools. A nail gun, sledgehammer, etc). Team Arrow engages them, but the HIVE agents make it out and nail their laptop and only evidence shut. Thea snags it as she runs out but barely make it herself from the imploding wreckage. 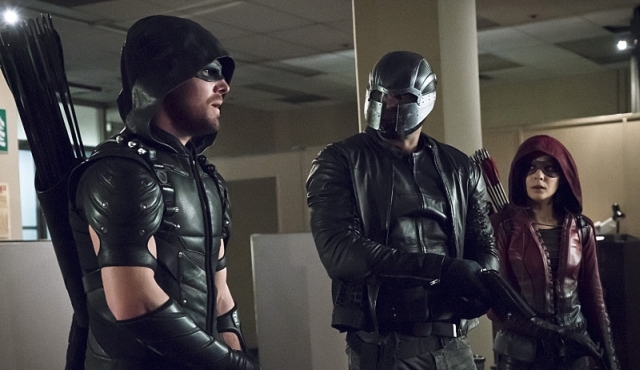 In the Arrow Cave, Diggle reports that his brother says they’re a demolition team assembled with experts from all over the world. Felicity prepares to get info off the laptop, reminding her of the first time Oliver asked her to do something. Ollie talks to Captain Lance, who drops the ironic line that luckily Oliver has someone he doesn’t need to keep secrets from. Back on the island, Reiter lectures Oliver on destiny and the maps he has which reference a person granted passage by the gods, who he believes to be Oliver. This person he says can grab a device of untold power from the island. Conklin enters and sends Reiter away, who tasks him with watching Oliver. Thinking on his feet, Oliver unlocks his handcuffs with a nail file and quickly finds a knife, so her can start a brawl with the soldier. At the loft, Mama Smoak confides in Felicity about her break up. She thought she’d found the one man that wouldn’t lie to her, and reveals she’s been living vicariously through Felicity, talking up Oliver and their relationship and his potential abilities as a father. 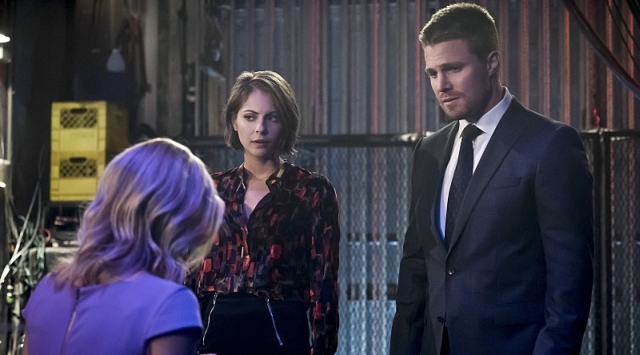 Thea and Oliver finish their debate prep and she reveals that she did some digging into Samantha Clayton, forcing Oliver to spill all the beans. He also talks of his internal struggle, how can he marry Felicity with this lie sitting there? Thea encourages him to do the right thing for William and keep him a secret, keep him safe. Diggle calls with a tip on the demo team’s tactics, they use a special acid for weakening the structures, but by the time they get to the plant they’ve already taken 100 gallons. Felicity goes to Palmer Tech to have Curtis work on the laptop and spies a cartoon caricature of herself on his computer. He waves it off as a wedding present for her. In the Arrow Cave, Lance and Oliver talk again and he asks how he was able to keep all these lies going for years. Oliver in his infinite wisdom says sometimes lying isn’t wrong if it’s for good and for someone you love. We flashback to the island where the knife fight commences and Oliver quickly gets stabby on Conklin, finally killing him. Took you long enough bud. Before Conklin dies, though, he reveals Reiter is going to kill them all anyway. It’s almost time for the debate and Curtis calls Felicity with the contents of the laptop, some blueprints, for the building where the debate is being held. They quickly realize HIVE wants to destroy the building to completely shape Ruve Davis’ campaign by making her the miraculous survivor of an accident. Thea pulls the fire alarm to get everyone out and Team Arrow goes in, followed by Captain Lance, to do their thing. They locate the bombs on the different levels of the building, and then find the demo team. The fights carry on, and even though these thugs have a unique style, that they don’t have names kind of takes the interest out of these fights. Team Arrow defeats the demo folks and disarms the bombs. As the debate is finally about to begin, Mama Smoak sees Quentin arresting one of the terrorists and lets out a sigh. Meanwhile, Oliver gets on stage with Ruve Davis and makes a sly nod to the fact he knew her plans. She is not amused. The biggest disappointment, of course, is that we didn’t get to see the debate in the lsightest, but good news: Oliver won! We return to the island one last time where Oliver claims self defense in killing Conkling. Reiter gives him a warning and the cryptic tease “there are other ways of being alive.” Taiana plants a kiss on his cheek as the flashback closes. Back in the loft, the engagement party is in full swing. Captain Lance enters and rekindles his romance with Mama Smoak, confessing the real reasons for everything that happened since the start of the season. Curtis comes to the party and reveals he finished up his present for Felicity, an implantable biostimulant, which will help her walk again. Oliver tells him he’s terrific (Get it? Because Curtis Holt is Mr. Terrific in the comics) and everyone is psyched. Meanwhile in Damien Dahrk’s big ugly house, he reveals to his daughter she has a new playmate, a young boy named William who they’re looking after for a little while for his mother. You can watch a preview for the next episode, titled “Taken” and featuring a first look at Vixen, in the player below.